Fortunately here’s 5 easy peasy tips that are fun, so doable and If you can implement just a few of them you’ll be happy you did. 1) Vegging on the couch is a sure fire recipe for a case of the munchies try getting involved in a board game of some sort it is a great way to keep you from over indulging especially around Christmas time. 2) Break it up….Instead of having a full fortnight of a blow out identify the important days, the big ones when you might not have control over what you eat or portion size days that you know you’re gonna be exposed to temptations. Highlight these days on the calendar on your phone the wall or the fridge. Give yourself permission to relax & enjoy these days. 3) Keep Exercising...Here’s the Truth Too Many Calories In + Not enough Calories Burned = Weight Gain it’s fairly simple isn’t it. You might not get out and about as easily over the Christmas whether it’s due to family commitments/work or adverse weather but you can still get your exercise done. You can access any number of clips on YouTube to guide you through your workout aiming for a minimum of 30mins cardio in one session. If you are out and about then take the stairs, park a bit further away from the shopping centre exit. The accumulation of small decisions will lead to more balance in you health. 4) Too sweet to be wholesome.!! Ever heard of this saying? Well they may not have been referring to food at the time but it certainly rings true when it comes to snacking. Eating simple carbs like sweets, cakes, crisps etc will cause your blood sugars to rise triggering the release of insulin which will start the cycle of cravings & fat storage. Instead of picking at the tin of roses you’d be far better served with a nice plate of cold meat or some cheese although they are more calorie dense they will leave you more satisfied for longer curbing the need for further picking. 5) Be the designated driver. We all know alcohol is a real enemy when it comes to weight management not just because of the amount of empty calories it contains or the fact that alcohol promotes fat storage in the body it also leaves you ravenous over the following days due to unbalanced blood sugars. If you do decide to be tee total while socialising try to opt for plain water, sparkling water, soda water or tonic water as minerals or cordials regular or diet will send your sugar levels all a tizzy again leading to cravings in the days after. If you must have a few drinks try to stay hydrated with some water in between every second or third drink (Trust me you’ll thank yourself the next morning). And If not enjoy yourself! As always I hope you get something useful from this article, If so please share it with others. Someone making one simple change can lead to big improvements. 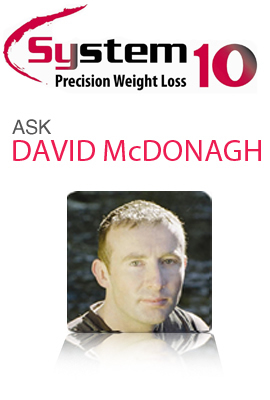 If you have any questions on anything above please email me at service@system10.ie and I will reply promptly. Merry Christmas and I hope a healthy new year awaits you and yours. My system is about real weight loss done the right way! My plan takes into account all the above reasons and more and makes sure weight loss will work for you. Don’t miss my NEW online plan starting soon where you can lose 10+ lbs in 25 days or 20+ Ibs in 50 days and get an amazing change in shape because it is real weight loss. Click here for more details. Alternatively, arrange a one to one consultation in your nearest clinic by clicking here.